PLO's Yasser Abed Rabbo says the "occupation" is to blame for the fact that there is little hopes for peace talks. A senior Palestinian Authority official has said that the chances to achieve peace with Israel are “slim”, and that it’s all the “occupation’s” fault. Speaking in an interview on PA television, the Secretary-General of the Palestine Liberation Organization (PLO), Yasser Abed Rabbo, said that Israel is placing obstacles in the way of progress in the peace talks because of the activities of the "occupation" in Judea and Samaria. 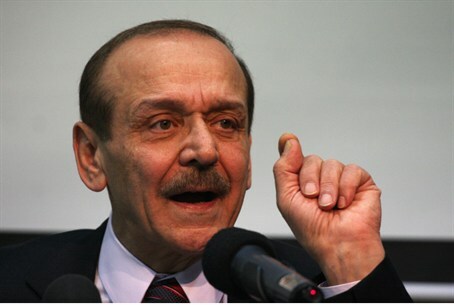 Abed Rabbo claimed in the interview that Israel and the U.S. were the only ones who benefit from the resumption of negotiations between Israel and the PA, since the U.S. wants quiet in the region, and Israel wants to achieve quiet in the international arena and to persuade the EU to lift its boycott on Jewish communities in Judea and Samaria. Among the “violations” committed by Israel, claimed Abed Rabbo, are the construction of new Jewish homes in Judea and Samaria and giving a green light to what he termed “settler gangs" and encouraging them to create a new reality in the Al-Aqsa Mosque. The latest comments follow ones made last week by the same Abed Rabbo, when he said that Middle East peace talks have so far proved "futile" and called for greater U.S. participation in talks. Ahead of the first bilateral meetings in Jerusalem on August 14, Israel announced plans to build more than 2,000 Jewish homes in Judea and Samaria. The move angered PA negotiators, despite the fact that they were informed of the building prior to the latest round of talks, and despite the fact that the construction will take place in areas which even the PA has accepted in previous negotiations will be within Israeli borders. The peace talks restarted after several rounds of shuttle diplomacy by U.S. Secretary of State John Kerry. Kerry asked both sides to keep the details of the negotiations secret in order to give the process a chance to work and, while Israeli officials have remain tight-lipped about the talks, PA officials have made several leaks to the press. Last Wednesday, a PA official said that during the negotiations, Israel agreed to a wholesale deportation of thousands of Jews from Judea and Samaria and the transfer of their property to PA Arabs. However, the PA official who reported on that Israeli offer added that the PA side had rejected it as not going far enough. That Israeli offer was reportedly made as part of a proposal to create a "Palestinian state" in Judea and Samaria along interim borders, pending a final-status agreement. Those rumors have alarmed Jewish residents of Judea and Samaria, who fear that such an arrangement will put their lives in danger. In an earlier leak to the press, the PA's chief negotiator , Saeb Erekat, told an Arabic radio station that the US has guaranteed the PA all of its key preconditions in advance of negotiations.